M. O’Herron Company was incorporated on July 27,1903 by Michael O’Herron, Joseph Kissane, and Charles Wolfe. By 1916, Joseph Kissane was the primary shareholder and the company has remained in the Kissane family. Joseph Kissane, Jr., joined the company in the 1920’s and was president of the company from 1935 to 1975. From incorporation through the 1950’s, the M. O’Herron Company was a road builder, utility contractor, and asphalt producer. Some notable projects included the Corliss tunnel, the Mon Warf, the stone wall along Bigelow Boulevard., and construction and paving of many roads in the City of Pittsburgh and Allegheny County. 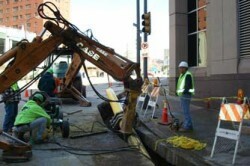 Installation of 1600’ of 12” and 400’ of 4” plastic natural gas main in Downtown Pittsburgh in order to provide service to the US Steel Tower. This project in the heart of Pittsburgh also included surface restoration of necessary roadways and sidewalks.